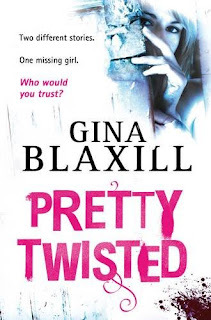 Pretty Twisted is an easy to read and enjoyable novel which had interesting and engaging characters and a storyline that kept me happily entertained as it twisted and turned its way along nicely. Pretty Twisted is told in a double narrative with alternating chapters from the two main characters Ros and Jonathan who first meet online completely by accident. Both of them are in quite a similiar place in that they come across as quite lonely and without much idea about where they really fit in. When they meet they instantly click as they have lots in common and both depend on their relationship probably more than they'd let on. Jonathan is 17 and living in rural Norfolk. His girlfriend is in London and his parents are forcing him to do A Levels he doesn't want to do. He doesn't feel like he has any proper friends and spends most of his time trying to work out how to go and visit his girlfriend Freja. Ros is 14 and living in London and also a bit lost. She isn't cool, doesn't even talk to boys and has a group of friends who don't really treat her properly. In Jonathan she finds a bit of a hero and a bit of a crush to idolise. To start with the two main characters storylines are separate except for their conversations online. It isn't until Jonathan's girlfriend goes missing that they finally meet and try to hunt her down in the middle of London. Things don't look good as other girls have gone missing and the police are sniffing round looking for a suspect and are particularly interested in why Jonathan and Ros have been spending so much time "stalking Freja". I liked that as the story progressed they became more and more intertwined despite the fact that the characters were little more than strangers at the start of the book. What I liked most about this book was its believability. So much about the characters was done just so which made me think that the author had clearly done her research and thought about ensuring that the storyline was something that actually could happen. They don't suddenly morph into teenage crime fighters who stop the bad guy totally unaided. I also enjoyed the friendship between Ros and Jono and how it developed and changed as the book progressed. All in a very enjoyable debut novel. I'll be looking out for the author's next offering.